The Town & Village of Wellsville were created from other Towns in 1850s. The heritege is deep and photos are abundant to show this wonderful local history. 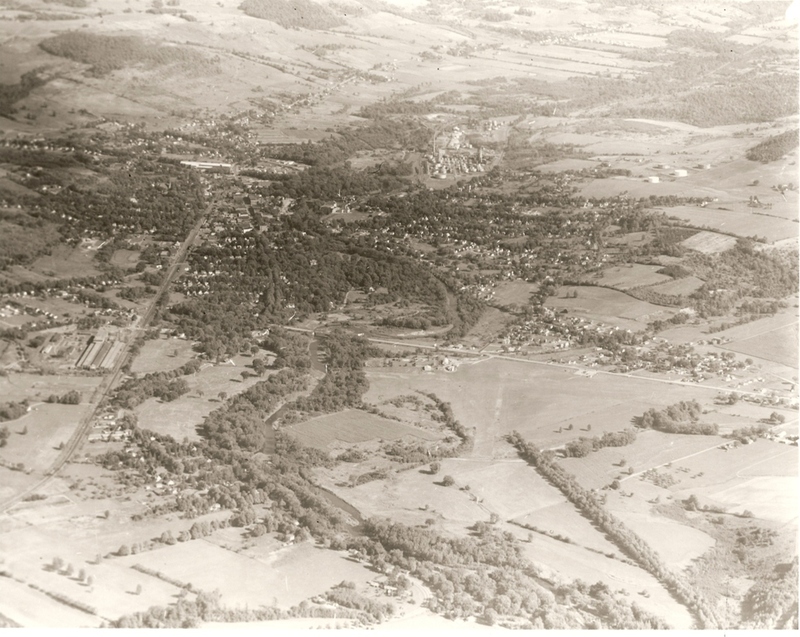 If you have a contribution of photos of Wellsville to share, please email to webmaster@alleganyhistory.org Below is a view of Wellsville Village and surrounding areas of the Town of Wellsville as depicted in about 1955. Viewable is (now) Dresser Rand, the winding path that the Genesee River took at that time, the tree lines that follow Main Street, the former "Crowner Field" Airport which is now covered with businesses along with a Nursing Home and Golf Course. Enjoy the many sub-folders full of photos of the past. If you like what you see and want this website to continue, please consider joining and supporting the Allegany County Historical Society. We are volunteers who have one thing in mind....sharing the History and Educating the Youth! We are in need of your support.